Couch Park is located in the Historic Alphabet District in NW Portland. Sharing ownership with Portland Public Schools, the park is the official home of Metropolitan Learning Center’s playground. The park also has a large 10,000 sf plaza that is an abandoned Right-of-Way that is used as a major North-South pedestrian thoroughfare. Finally, there are the rolling, grassy berms and pathways surrounded by a dense canopy of trees that make up the remainder of the park. The re-design of the plaza and playground was the highest priority and most costly of all the 2016 Bond Projects dedicated to refurbishing aging parks and playgrounds in Portland. The old wood playground structure beloved by the MLC students was removed in 2015 due extensive structural rot and multiple hazards. The plaza was no longer ADA accessible due the the humps and bumps from differential settlement between concrete bands and brick pavers. The plaza and playground had old trees, some that were in poor conditions, others that would present challenges for designing and construction around without serious impacts. 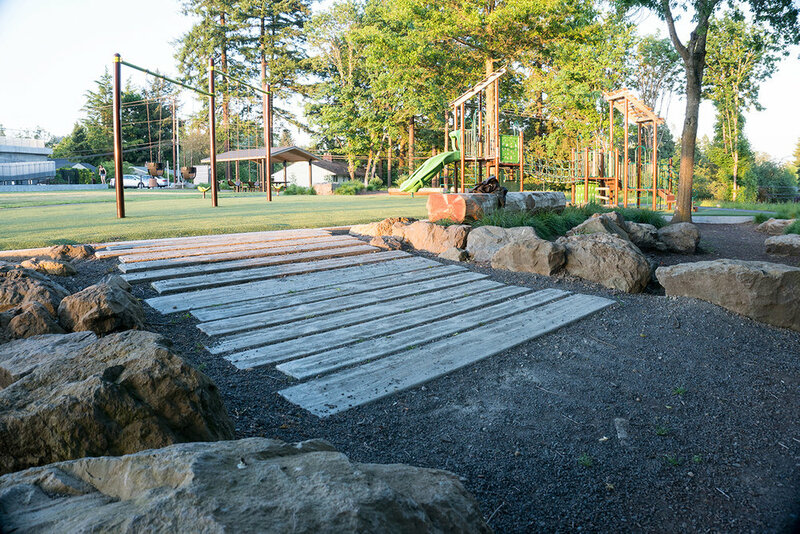 The playground, Portland’s first inclusive playground on the west side, is designed for kids of all ages and abilities and is a true hybrid of natural elements and factory built play equipment. The focal point being a fort on a mound that skirts between large trees to make kids feel like they are in a tree fort, is by far the coolest thing in the playground that kids will use as a centerpiece to create their own adventures and games. The design for the plaza and playground are within the same footprint as the previous spaces as required by the language of the bond. The plaza’s bold paving patterns are based on the historic grid of bricks and concrete bands but use different textures of concrete to replicate the historic paving pattern. A distinguishing characteristic of the design is demonstrated in the forward thinking of incorporating sustainable stormwater practices into parks and urban plazas. The design showcases vegetated stormwater planters as a primary space maker verses pushing them to the side to inconsequential spaces as mandatory minimum add-ons. The flow through planters define the circulation zones, separate the playground from the plaza, create edges for sitting, and provide a healthy splash of color to a very urban neighborhood. 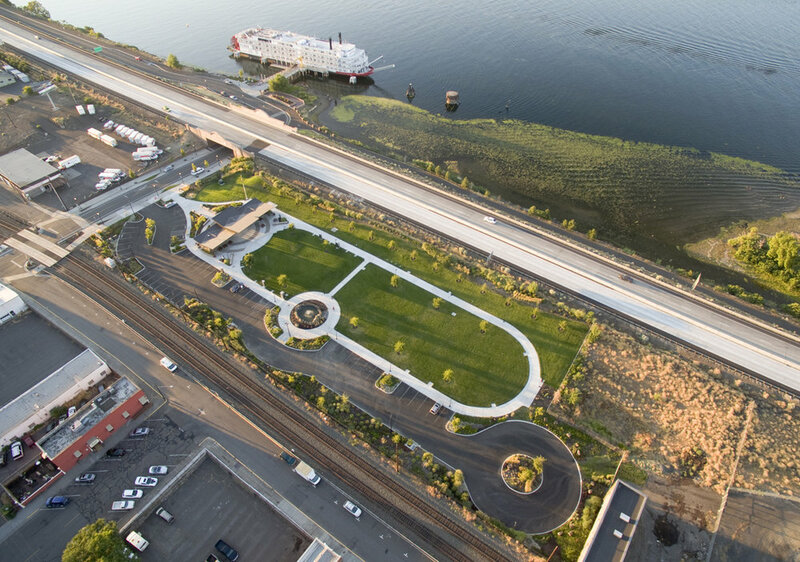 As part of a comprehensive visioning project, GreenWorks helped to envision the future of the Astoria riverfront. The design team assisted in planning for open space and pedestrian connections that reinforce the values of the community and preserve the special character of this historic city. GreenWorks also helped facilitate visioning workshops and provided the community with imagery, plans, and strategies to guide future development. The National Oceanic and Atmospheric Administration (NOAA) honored this project with its Walter B. Jones Memorial and NOAA Excellence Awards. GreenWorks went on to develop concepts for the Astoria Riverwalk with the goal of developing a multi-modal approach that accommodates a historic trolley line, business access for deliveries, bicycle traffic, as well as a pedestrian trail along the waterfront complete with wayfinding elements. The design character for the Riverwalk elements reflects industrial waterfront themes. Sketches were prepared to show unifying themes incorporated into varied settings along the waterfront. GreenWorks also developed the wayfinding plan for downtown Astoria. The scope includes preparing a concept plan detailing locations of proposed improvements and illustrations of signage components. Working closely with the City and Downtown Association representatives, GreenWorks prepared a set of signage typologies to provide the community with a cohesive downtown wayfinding plan. 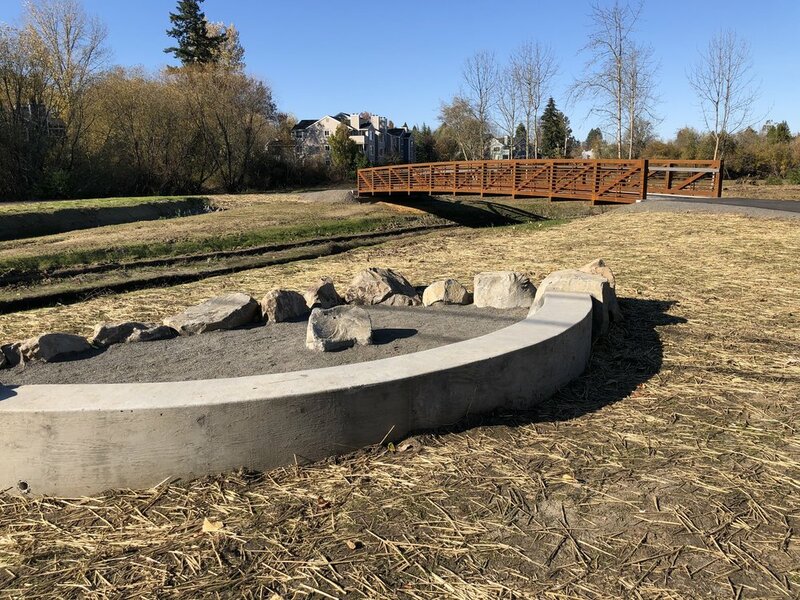 North Clackamas Parks and Recreation District and the City of Milwaukie partnered to improve in-stream and riparian areas and a new trail access at Spring Park in Milwaukie, Oregon. 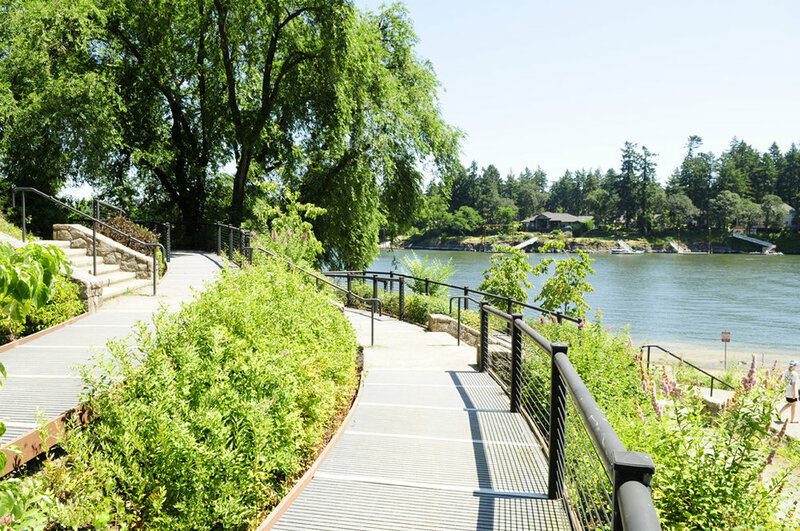 As the project Landscape Architect, GreenWorks analyzed the topography and sensitive areas to find the ideal location for a soft surface trail, boardwalk, and overlook that would improve access and provide excellent user experience within the restored riparian landscape. GreenWorks aided Tualatin Valley Water District (TVWD) in replacing an outdated reservoir with a new one adjacent to Ridgewood View Park in Beaverton. The new water project required extensive piping and construction staging on the Tualatin Hills Parks and Recreation District (THPRD) park site. In turn, TVWD needed to upgrade the amenities in Ridgewood View. GreenWork’s proposed new park elements including open lawn, paths, parking, picnic shelters, access to natural areas, playgrounds, and a bocce ball and tennis court on top of the reservoir. Innovative elements for the project included terraced rain gardens that treat and convey stormwater from the roof of the reservoir. The park’s new rain gardens help screen the 15’ wall of the reservoir in the park and provide an educational resource for TVWD, THPRD, and the residents of the neighborhood. GreenWorks with sub-consultants, Inter-fluve, Inc and HDR, are working with Bend Park and Recreation District (District) on the Mirror Pond Trail and Bank Improvement Project. In 2013, GreenWorks worked on a Visioning Plan for Mirror Pond from the Galveston Bridge downstream to the Portland Bridge including both sides of the river. In early 2017, the GreenWorks team moved forward with design to repair failing systems along the river, connect and extend the Deschutes River Trail, address ADA, mobility and access and create and enhance habitat. The project site is in the heart of downtown Bend and spans from Drake Park through private land to Pacific Park along the right bank of the Mirror Pond and the Deschutes River. Drake Park is a popular downtown community gathering place and is highly used by floaters, runners, cyclists, pedestrians and others. There are user conflicts between floaters and pedestrians and cyclists and pedestrians. Drake Park, on the upstream end, is also the hop-out site to take the River Shuttle. Due to the high traffic, GreenWorks is designing a large waiting plaza with restrooms and benches across from the shuttle parking. In addition, the team is working to expand and enhance the beach, making this location a more enjoyable and safe location for users. There are sections along Drake Park that preclude cyclists, strollers and wheel chairs as well as areas where there are user conflicts between pedestrians and cyclists. 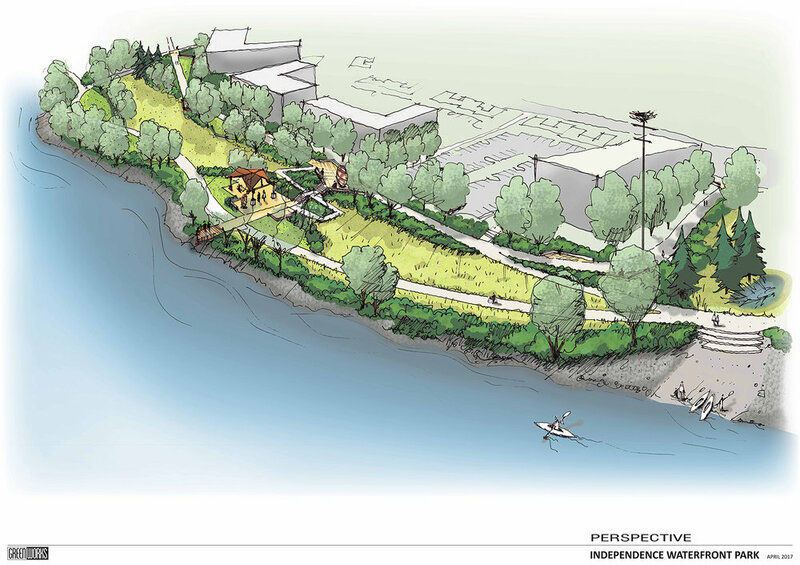 The GreenWorks team has creatively designed an accessible route to connect the Deschutes River Trail from Pioneer Park downstream through Pacific Park where it meanders on back surface streets until it reaches a new boardwalk at Newport Bridge. The boardwalk will span from Newport Bridge along the edge of Mirror Pond to the plaza in the center of Drake Park. Once users get to the plaza, there will be spilt in the trail, cyclists will traverse toward the road and meet back with the original alignment of the DRT and pedestrians will along the water edge. Banks along the river are eroding and there is constant maintenance. The GreenWorks team along with stakeholders worked together to determine that the banks were not to be armored with rip rap but where to address erosion as well as create habitat. The solution involves the removal of the concrete cap on top of the wall, deconstruction of banks and reuse the rock in place, adding large wood a few strategic locations as well as riparian plantings. In two sections of the project where the large wood will be located, split rail fence will be installed to deter the trampling of vegetation that will allow for the vegetation to remain in place for the enhancement and creation of habitat. Currently, GreenWorks is beginning to move the design from 30% to 100% and eventually through construction. In The Dalles, East 1st Street and adjacent properties from Union Street to Laughlin Street posed unique development opportunities and design challenges within the heart of the community. The area had long been an unattractive, back alley view of the community from Interstate-84 and a neglected downtown street. The four-block long right-of-way was complicated by the adjacency of Union Pacific Railroad mainline tracks, unequal and narrow ROW widths, major elevation differences with adjacent properties, National Historic District requirements, and access issues. These challenges also offered a multitude of design opportunities for a distinctive streetscape and park redevelopment which ultimately has become a focal point for redevelopment and an invigorated downtown center. East 1st Street is now a gateway from the downtown to the Columbia Riverfront where vehicle, bicycle, and pedestrian traffic intermingles. GreenWorks and a team of engineers developed preliminary and final designs for East 1st Street streetscape, a pedestrian/bicycle under-crossing of the two mainline Union Pacific Railroad tracks, a pedestrian plaza at Washington Street, a cruise ship and public dock area connecting the City of The Dalles to the Historic Columbia River, and the iconic Lewis and Clark Festival Park. The project has served to enhance community identity and encourage economic development. 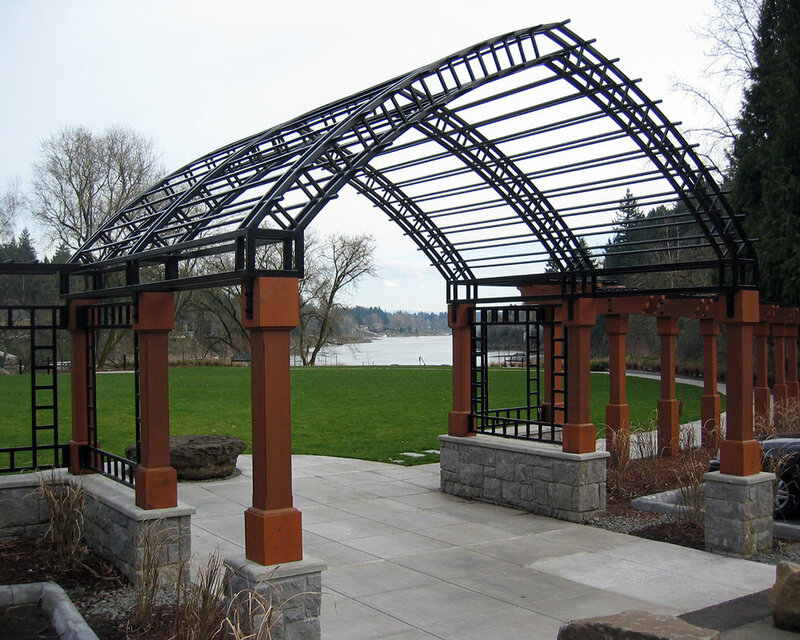 GreenWorks prepared the Master Plan and design services for George Rogers Park located along the Willamette River in Lake Oswego. 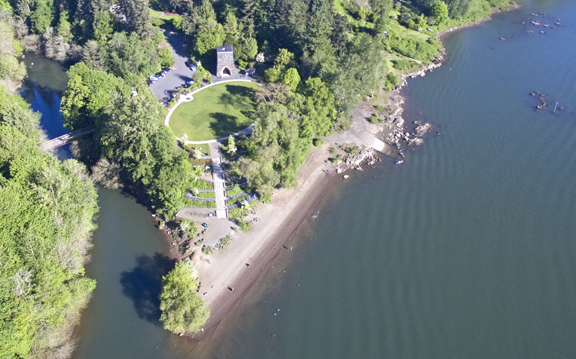 The project created visual and physical connections to the Willamette River and between elements within the park. Gateway enhancements, interpretive elements, and improved waterfront access were key design components. Creating a cohesive plan was paramount and included unifying the Barbecue Terrace with the Memorial Garden Terrace. The design also provided a soft canoe launch and waterfront access improvements. Boardwalks connected terraces and provided overlooks to the public beach area. The project removed existing pavings within the floodplain and provided mitigation plantings for all encroachments in the floodplain and greenway. GreenWorks has started consulting work with Bend Parks and Recreation District on alternatives that will provide four different solutions for the community to consider for the iconic Mirror Pond on the Deschutes River in Bend, Oregon. Each option, ranging from taking out a dam to dredging or something in between, will illustrate the visual impact, cost estimates, regulatory requirements, challenges and opportunities. Cape Horn Trail is an eight-mile trail in Skamania County located twenty-six miles east of Vancouver, WA. GreenWorks is providing services for the US Forest Service for improvements to an existing trail, which has two at grade crossings where hikers and horseback riders traverse the heavily traveled State Route 14. To improve safety for trail users, the Forest Service and WSDOT are constructing pedestrian underpass tunnels at these two crossings. 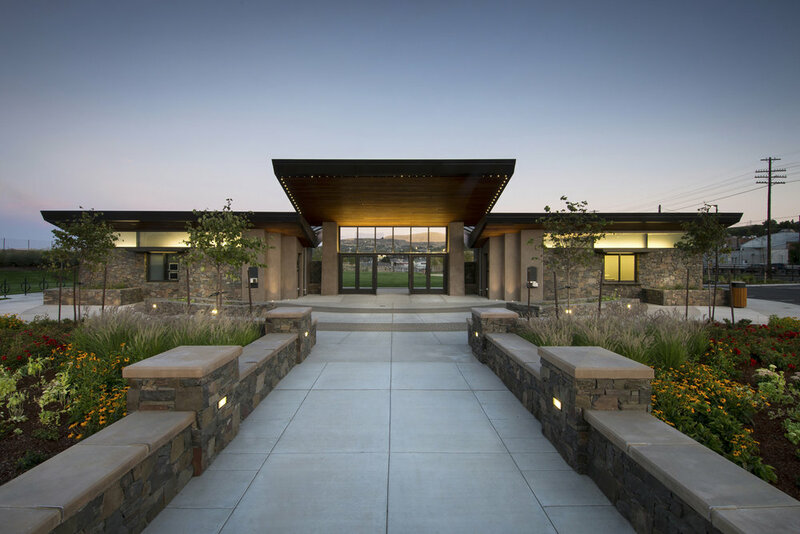 GreenWorks developed schematic designs for the tunnel entrances and provided construction design drawings for the tunnel fascias, which include stonewall construction, custom metal guardrail fencing design and planting design around the entrances. 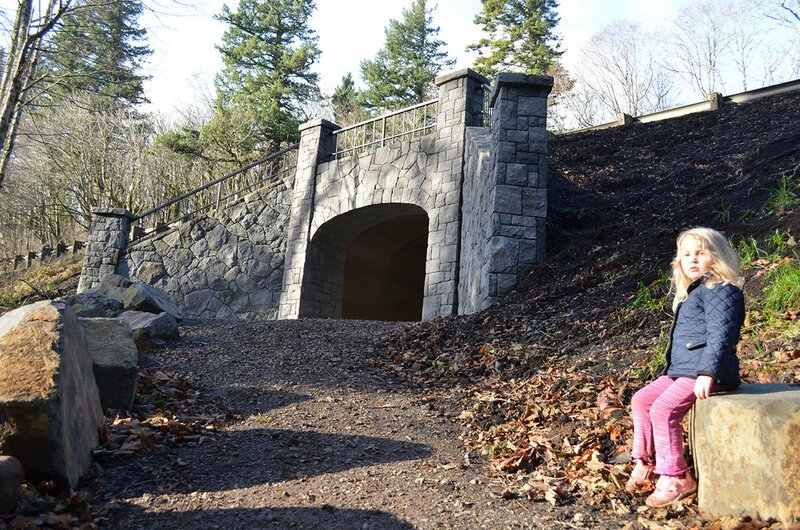 The design of the tunnel fascias incorporate locally quarried Columbia River Basalt to form walls that echo other examples of historic basalt stone work in the Columbia Gorge. 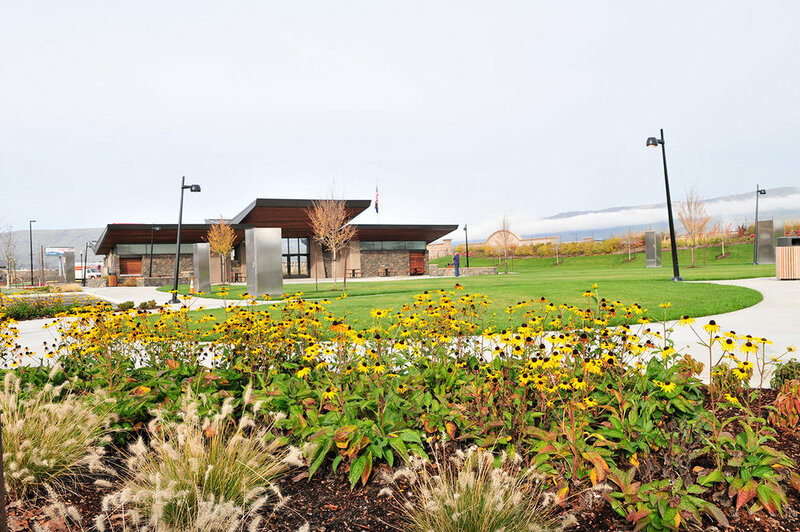 As a sub to Opsis, GreenWorks provided services to Bend Parks and Recreation District (BPRD) for the conversion of a former 3.25 acre parking lot into a new open-air pavilion that will house an Olympic-standard ice rink in the winter and numerous activities such as tennis, basketball, and concerts in the summer. The site was redeveloped with an iconic pavilion structure, support facilities, a courtyard green, and flexible lawn spaces adjacent to the pavilion for community events. Per BPRD’s direction, several Low Impact Development (LID) techniques were incorporated. For stormwater management, LID alternatives such as infiltration swales and galleries throughout the site for stormwater collection were provided. Other LID options include providing ample bicycle access, bicycle parking, and pedestrian connectivity. The project was completed in 2015. Greenworks is honored to be working with the City of Independence to implement the vision set forth in the Open Space Master Plan completed in 2015. The current work on Independence Landing improves a key piece of public waterfront located immediately south of Riverview Park, the flagship of the Independence park system. Designed in tandem with the with the large waterfront re-development on the old Valley Concrete Site, Independence Landing is one piece in a larger orchestrated effort to revitalize downtown Independence and support commercial growth. Conceived of a an extension of Riverview Park, Independence landing will offer users a number of passive recreation opportunities. Included in the plan are a waterfront multi-use trail with a river overlook, a shaded patio and lawn space able to accommodate flexible programming, a sizeable restoration planting area braided by soft surface trails and a grove of shade trees in which the user can find informal, private seating areas. This implementation of the Open Space Master Plan sets the stage for the continued expansion of improved public waterfront southward along the Willamette River and strengthens the downtown, pedestrian connections to the waterfront. The success of this project has been a measure of how well the project team has worked together. Shawn Irvine and David Clyne with the City of Independence and Steve Ward with Westech Engineering have been instrumental in guiding the design process, representing the diverse community of Independence and streamlining the construction of this exciting new park space. GreenWorks has hired by Clean Water Services on a multi-disciplinary team lead by HDR to restore a segment of Fanno Creek and improve the Fanno Creek Trail in downtown Tigard. GreenWorks’ role on the project is to provide trail design for a quarter mile segment of the 15-mile regional trail that extends from Tualatin to Portland through Tigard. The creek enhancements include restoring a previously straightened portion of the creek to a natural, meandering alignment that will improve hydrologic function of the creek and adjacent floodplain. The Fanno Creek Trail improvements will mimic the new creek alignment to draw pedestrians and bikers further into the park to experience the natural environment. The project also includes replacing an old bridge that will be elevated to improve stream hydrology and maximize trail function for bikers using the Fanno Creek Trail. Gateway Green is a 25-acre site located in East Portland at the confluence of two major freeways. This previously unused remnant landscape has a host of complicated public access challenges making the prospect of creating a park seemingly impossible. Community leaders and advocates who saw a potential for reclaiming this forgotten landscape have been instrumental in framing a vision and rallying support for developing the site into a usable park space. Because of the challenges Gateway Green presented—its size, unique terrain, close proximity to light rail, and lack of adequate access for pedestrians—off-road cycling was identified as one of the many viable, long-term uses envisioned for the site. In 2017, temporary off-road bike trails were constructed as a means to activate the site and deter homeless camping. The immediate success of the bike facilities has brought local and national recognition to the project, which in turn has given the City of Portland and the project partners motivation and support to push forward with refining the long-term vision to include other uses. A plan has recently been developed to guide future work to restore habitat, improve access, and enhance other recreational activities. The crux of the design challenge has been to create a plan that balances active and passive uses along with innovative urban habitat restoration. Robust support for developing the site has been led by the highly visible and active group, Friends of Gateway Green (FoGG). Since 2008, FoGG has envisioned Gateway Green as a place that could provide a much-needed site for off-road cycling, and other outdoor recreation in East Portland. FoGG’s advocacy and partnership building has made the project become a reality.